Simon Whitlock won the PDC’s fifth and final European Tour event of 2012, defeating Australian World Cup teammate Paul Nicholson in the final of the Dutch Darts Masters on Sunday evening. ‘The Wizard’, who recently won his first major title when he was crowned European Champion in Germany, triumphed 6-1 against Nicholson to clinch the £15,000 first prize. The world number six, who had seen off Per Laursen and Alan Tabern to reach Sunday’s last 16, began the day with a 6-1 victory over Ian White. He then saw off Johnny Haines 6-2, before producing a brilliant semi-final performance to beat Kim Huybrechts 6-1. Whitlock then made sure he claimed his third PDC title in less than two months, when he defeated ‘The Asset’ by the same scoreline. 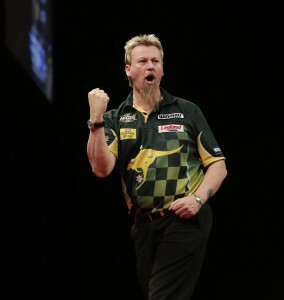 “It feels fantastic and I’m over the moon to win,” Whitlock told the PDC’s official website. “It’s brilliant for two Australians to be in the final and Paul’s done really well this weekend. “I seem to perform well on the Continent and to follow up the European Championship win with this is great. “I can’t wait for the World Championship now and hopefully I’ll be holding the trophy at the end of that too! Nicholson, who was competing in the final day of a European Tour event for the first time, kicked off his Sunday with a 6-1 success over Max Hopp in the last 16, having beaten Ross Smith and Michael van Gerwen to reach that stage. The 2010 Players Championship Finals winner saw off Arron Monk, who reached his first European Tour quarter-final, before producing a fabulous display to defeat Wayne Jones in the semis, with the aid of a 101.02 average. Nicholson said: “It’s been a huge weekend for me. This year has been up and down but this weekend has proved to me that all the hard work really has been worth it. “I’ve had some really tough games and played some great darts. By the time the final came around I was shattered and ran out of steam but Simon’s been used to getting this far in tournaments this year and I haven’t. He’s had a bit more darts fitness than me and I give him all the credit. 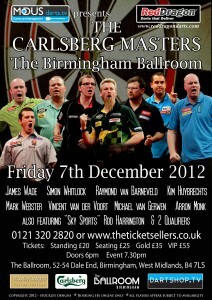 Book tickets to see some of the world’s top darts players in action at The Carlsberg Masters, Birmingham on Friday December 7. Arron Monk reached his first European Tour quarter-final with an impressive win over Andy Hamilton, while Australian pair Paul Nicholson and Simon Whitlock also won through to the last eight of the Dutch Darts Masters on Sunday afternoon. Monk, the former under-21 World Champion, claimed a 6-4 victory against the world number seven in Nuland, setting up a quarter-final clash with Nicholson. ‘The Asset’ ended the run of German teenager Max Hopp with a 6-1 success, while Whitlock defeated Ian White by the same scoreline, posting a 102.5 average in a brilliant performance. Sunday evening sees the £82,100 tournament reach its conclusion, with the remaining eight players competing for the £15,000 first prize. Paul Nicholson hailed the influence of Michael van Gerwen’s recent rise to form after defeating the home favourite in the second round of the Dutch Darts Masters in Nuland, while Simon Whitlock, Arron Monk and Andy Jenkins also won through to the last 16 on Saturday. Nicholson triumphed 6-4 against the newly-crowned World Grand Prix champion, who has won six PDC events in total so far this year, setting up a third round clash with German teenager Max Hopp on Sunday afternoon. “I’m delighted to have won because this is the first time in the five European Tour events this year that I’ve made it to the Sunday,” Nicholson told the PDC’s official website. “I came into the game with no pressure because Michael is in such great form and I relaxed and enjoyed the match. “Michael is inspiring people to play better at the moment, including me, and he’s also taking Dutch darts forward. He’s a great example for all young players coming into the game. Hampshire youngster Monk will face Andy Hamilton in the last 16 after the former under-21 World Champion defeated Vincent van der Voort 6-5, producing a 13 dart finish in the deciding leg. Australian star Whitlock, the reigning European Champion, eased through with a 6-2 win over Alan Tabern, while Jenkins continued to make his mark on the £82,100 tournament with a 6-4 success over James Hubbard. 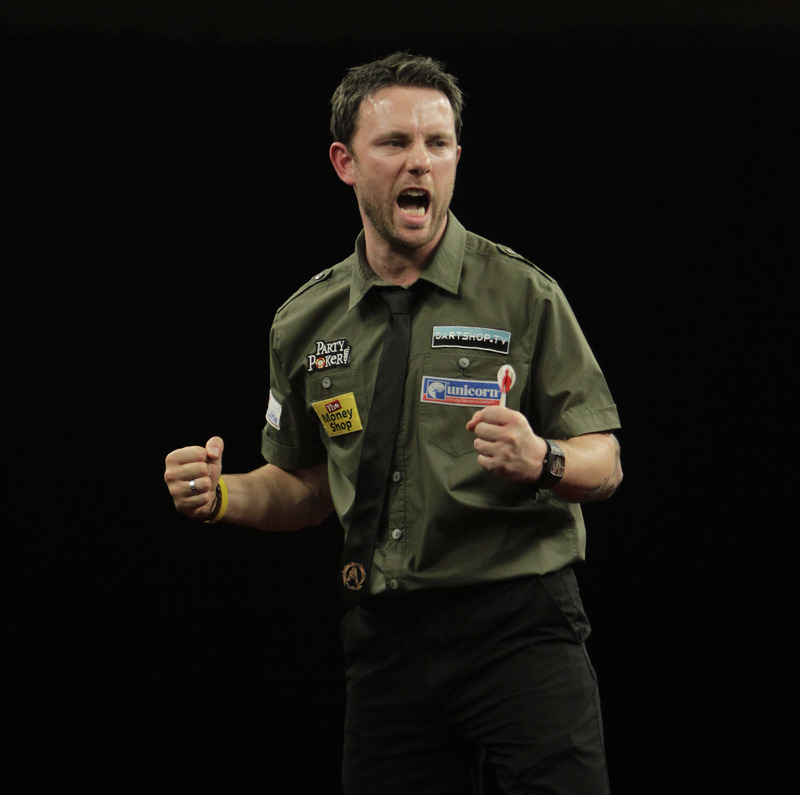 ‘The Wizard’ will take on Ian White in the last 16, while Jenkins faces Wayne Jones. Dutch pair Raymond van Barneveld and Co Stompe were eliminated from the tournament though, despite the latter hitting a maximum 170 checkout against world number one Phil Taylor. The remaining 16 players will battle it our for the £15,000 first prize over two sessions on Sunday, with the third round taking place in the afternoon before the quarter-finals, semi-finals and final are played out in the evening. Michael van Gerwen, Raymond van Barneveld, Vincent van der Voort and Co Stompe all delighted their home crowd with victories in the first round of the Dutch Darts Masters on Friday. Mervyn King, Andy Jenkins, Paul Nicholson, Simon Whitlock, James Hubbard and Arron Monk all also progressed to the last 32 of the PDC’s fifth and final European Tour event of the year in Nuland. van Gerwen, who won his first PDC major title at the World Grand Prix a fortnight ago, enjoyed a 6-4 triumph over Peter Hudson. 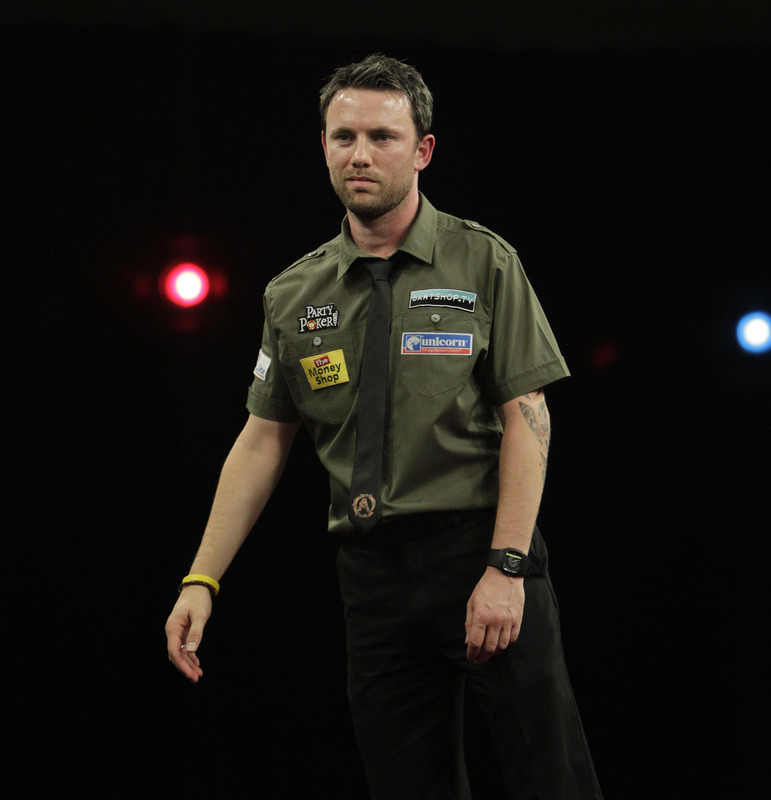 The world number eight will face Paul Nicholson on Saturday after ‘The Asset’ saw off Ross Smith 6-3. “It was a difficult game because this is my first tournament in Holland for a year and there was a bit more pressure than normal on me,” van Gerwen told the PDC’s official website. “I wasn’t nervous but I wanted to show everyone in Holland what I can do and how well I’ve been playing in the last few weeks. “I’m happy to win the game but it wasn’t easy because Peter is a good player. I wasn’t brilliant in every leg, but a win is a win and I’m looking forward to playing against Paul. 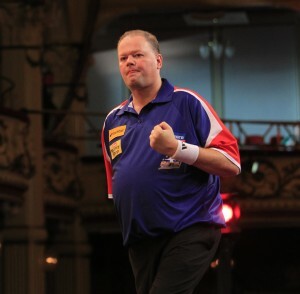 van Barneveld came back from 3-1 down to record a 6-3 victory against Mick Todd. The five-time World Champion will take on Johnny Haines on Saturday evening. van der Voort faces Monk after the ‘Dutch Destroyer’ whitewashed Bernd Roith, while Monk claimed an impressive triumph over John Part, defeating the three-time World Champion 6-4. Stompe set up a second round clash against world number one Phil Taylor, after a 6-2 win against Terry Temple on Friday afternoon. King, who will play Ian White on Saturday, stormed past Ronny Huybrechts with a 6-1 victory, while Jenkins claimed a notable success over Justin Pipe, beating the world number eleven 6-2. ‘Rocky’ will face Hubbard in the last 32, after the World Youth Champion defeated Denis Ovens by the same scoreline. European Champion Whitlock was a 6-4 victor against Denmark’s Per Laursen. ‘The Wizard’ faces Alan Tabern in the second round. Saturday sees round two take place over two sessions, as the field chasing the £15,000 first prize is reduced to 16. Tickets are on sale to see some of the best darts players on the planet, including five major champions, at an exclusive non-televised professional event in Birmingham on December 7. The stars, including world number three James Wade, winner of seven major titles, and five-time World Champion Raymond van Barneveld, will be showing their skills at The Birmingham Ballroom in the inaugural Carlsberg Masters. They will be joined by reigning European Champion Simon Whitlock, recently-crowned World Grand Prix Champion Michael van Gerwen and another former World Champion, Mark Webster. 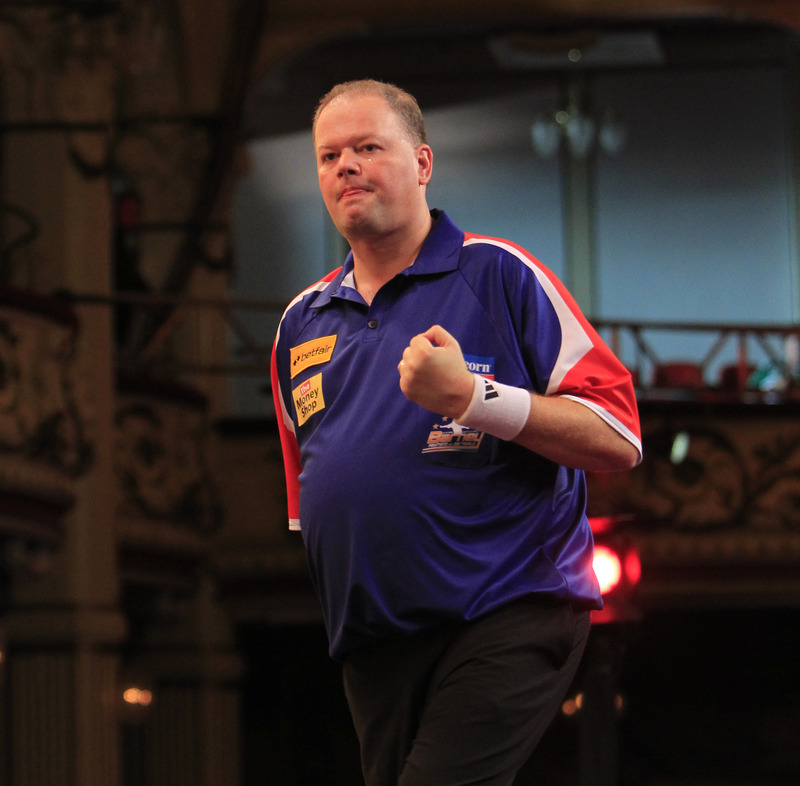 Quick-fire Dutchman Vincent van der Voort will also be competing on the night, as will Belgian ace Kim Huybrechts. Completing the star-studded line up will be former under-21 World Champion Arron Monk, alongside two local qualifiers, who will be attempting to topple the professionals. Sky Sports’ Rod Harrington will also be in attendance as a VIP host, as top class darts heads to Birmingham. George Noble of MODUS darts said: “This really is an incredible line-up and will be the best darts event Birmingham has seen since the Premier League. “You don’t get this opportunity in any other sport. We are bringing some of the top players on the planet to more intimate surroundings, for the entertainment of local darts fans. “All of the players will be determined to hit top form here as it is their warm-up for the World Championship. 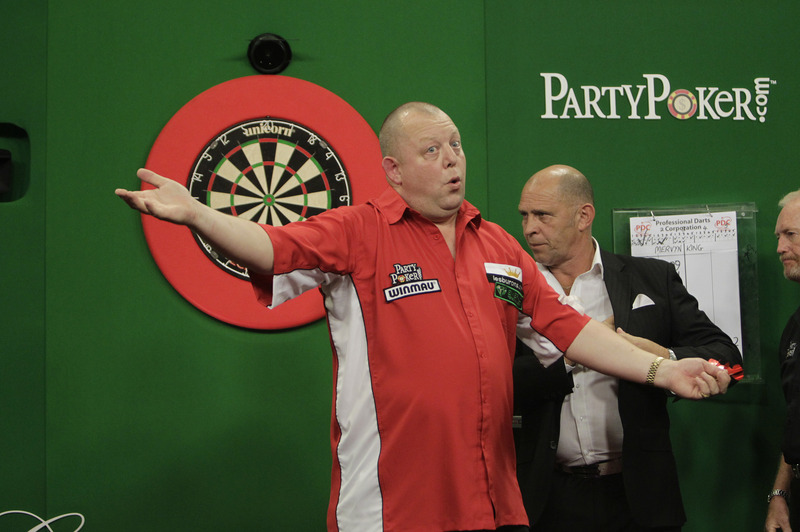 The PDC’s fifth and final European Tour Event of 2012, the Dutch Darts Masters, takes place in Nuland this weekend. The first round of the £82,100 tournament is spread over two sessions on Friday. The afternoon session sees World Grand Prix runner-up Mervyn King take on Ronny Huybrechts on the main stage, before Andy Jenkins faces Justin Pipe. Home favourite Co Stompe is up against Terry Temple, also on the main stage, while PDC Unicorn World Youth Champion James Hubbard plays Denis Ovens on stage two. Former Players Champion Paul Nicholson completes the afternoon’s action on stage two when he faces 23-year-old prospect Ross Smith. The evening session sees European Champion Simon Whitlock take to the main stage. ‘The Wizard’ takes on Denmark’s Per Laursen, before former PDC Under-21 World Champion Arron Monk plays Canadian ace John Part, the three-times World Champion. Dutch trio Vincent van der Voort, Michael van Gerwen and Raymond van Barneveld are all in action on the main stage on Friday evening. van der Voort is up against Bernd Roith, while newly-crowned World Grand Prix champion van Gerwen takes on Peter Hudson. Five-time World Champion van Barneveld faces Mick Todd. Meanwhile, Welsh star Mark Webster takes on Mark Jones on stage two. UK Open winner Robert Thornton has been forced to withdraw from the event due to a chest infection, which has prevented him from travelling. The second round will take place over two sessions on Saturday, with the remainder of the tournament being played on Sunday. 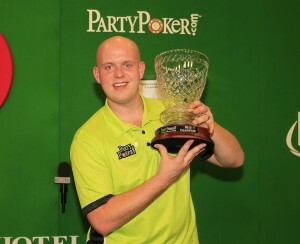 Michael van Gerwen continued his brilliant form by taking his fifth Pro Tour title of 2012 with victory in the John McEvoy Gold Dart Classic Players Championship on Sunday. The 23-year-old Dutch sensation, who won his first PDC major title in Dublin last Sunday, defeated Nick Fullwell 6-3 in the final in Killarney. The newly-crowned World Grand Prix champion claimed victories over Bernd Roith, Mick Todd, Roland Scholten and Colin Lloyd to reach the quarter-finals, where he saw off Kevin Mcdine. ‘Mighty Mike’ then defeated Jamie Caven 6-3, with the aid of a stunning 113.09 average, before triumphing over Fullwell by the same margin, to clinch the £6,000 first prize. Saturday’s event saw Robert Thornton add to his impressive run of form, with the UK Open winner reaching his third consecutive Pro Tour final. ‘The Thorn’ disposed of Stuart Kellet, Prakash Jiwa, Damien O’Driscoll, Jamie Caven, Andy Smith and Darren Webster, before being denied victory by an on song Wright. See Michael van Gerwen in action alongside Whitlock, Barney, Wade, Webster, van der Voort & Monk at THE CARLSBERG MASTERS, Birmingham on Friday December 7. Michael van Gerwen produced a brilliant fightback to clinch his first PDC major title with a fantastic victory over Mervyn King in the final of the World Grand Prix in Dublin on Sunday. The Dutchman, who has won four Pro Tour titles this year, trailed ‘The King’ by four sets to one, before storming back to win five on the spin to take the £100,000 crown. “This is the best day of my life,” said ‘Mighty Mike’, whose triumph sees him leap 17 places up the PDC order of merit to eighth. “To win this tournament is an amazing achievement for me, but to do it in a game like that makes it even more special. “Mervyn is a fantastic player and he made it really hard for me but even at four one down, I knew I could go on a run. “That’s exactly what happened and I was over the moon when that last dart went in. van Gerwen looked to have got in to his stride straight away, scoring 170 to set up double eight to take the opening leg. But King took three legs in a row to win the first set. King held his throw in the first leg of the second set before van Gerwen’s second 180 helped him draw level. The former Premier League star reeled off the next two legs though, opening up a two set cushion. King moved two legs clear in set three, with fine finishes of 102 and 93, but ‘Mighty Mike’ hit back by hitting double 16, after setting it up with 159. It didn’t prevent King from taking a third consecutive set however, as he produced a brilliant 152 checkout to get half way to the finishing line. van Gerwen managed to break his opponent’s throw for the first time in the opening leg of the fourth set, before doubling his lead on double eight. The Dutchman then slotted in a fourth 180 but King took out 120 to keep the set alive. ‘Mighty Mike’ did the same in terms of the match, hitting double eight to reduce King’s set lead to three one. The 23-year-old quickly took the first two legs in the fifth set, posting double top on both occasions. But he missed three darts for the set, allowing ‘The King’ to force a deciding leg. It looked like it would be a pivotal one when van Gerwen missed three darts at double eight, leaving King to clean up 48 to restore a three set lead. The Dutch star took out 75 to break King’s throw, before holding with a neat 87 finish. He completed a clean sweep, hitting double tops after a 160 start, to reduce his opponent’s lead to 4-2.
van Gerwen moved ahead in the seventh set, winning a leg that included a bull, bull, 25 party piece before bedding double top. He then took out 92 for a break of throw before truly announcing his presence in the final with a brilliant 131 checkout to close the gap to a single set. ‘Mighty Mike’ took a seventh leg on the spin and missed eight darts to make it eight in a row. King stopped the rot by hitting double 16 but a third consecutive break of throw took van Gerwen a leg away from levelling up the match. And he did exactly that, hitting double twelve to effectively make it a race to two sets for the £100,000 title. ‘The King’ hit double four to break and edge back in front, before moving two legs ahead in the ninth set, in a leg where both players hit 180s, which King followed up with a 117 checkout. ‘Mighty Mike’ bedded double eight to stay in the set and then hit double twelve to level it. The young Dutch sensation then hit tops to take the lead for the first time since the very first leg of the match, moving a set away from victory in the process. He broke King’s throw in the first leg of the tenth set before a fine 79 finish put him within a leg of victory. Ever the showman, van Gerwen became champion in style, saving his highest finish of the match, a sensational 145 checkout, for the final leg. The Dutch star, who is now the highest ranked player from his homeland after leapfrogging Raymond van Barneveld, will now turn his attentions to next month’s Grand Slam of Darts and the World Championships in December. He added: “At the start of this year I was ranked 38th in the world. Now I am eighth and that is a dream for me. “Raymond is a fantastic player so to go above him really is something special and I’m proud of it. “Now I know how to win a major like this, I know I can win anything and I’m looking forward to going into the Grand Slam full of confidence and I’ll take it from there. Michael van Gerwen and Mervyn King are both bidding to win their first major PDC title after impressive PartyPoker.com World Grand Prix semi-final victories in Dublin on Saturday. van Gerwen stormed past world number six Wez Newton, while King saw off the challenge of crowd favourite Brendan Dolan at the Citywest Hotel. The pair, both former World Masters in their BDO days, will battle it out for the £100,000 title on Sunday evening. ‘Mighty Mike’ shared the first two sets with Newton in a close opening to the match. The Dutch ace then took the next two sets, both on deciding legs, before winning six of the last seven to seal the victory, posting a brilliant 95.04 average in the process. “It feels amazing,” admitted van Gerwen, who defeated Colin Lloyd, Adrian Lewis and Andy Hamilton before his last four triumph. “I am so happy to be in my first PDC major final, especially in a very hard tournament like this. King will take on the 23-year-old star after he ended Northern Irishman Dolan’s run with a 5-2 success. ‘The King’ hit back from two legs down to win the first set, silencing the home crowd. He took the second set 3-1 but Dolan halved his lead, winning set three with a brilliant 170 checkout. King restored his two set lead though and then increased his advantage by winning a deciding leg in the fifth set. He then missed four match darts in the sixth set decider, granting last year’s runner up a stay of execution. But the former Premier League finalist produced fantastic finishes of 108 and 132 to complete a terrific victory. “I’ve put a lot of hard work in so I’m delighted it’s finally paying off,” said King. “It’s going to be a very hard game against Michael. He is playing incredibly well at the moment and he deserves to be there. “Obviously when we go on stage tomorrow I’ll want him to lose, but thats darts. 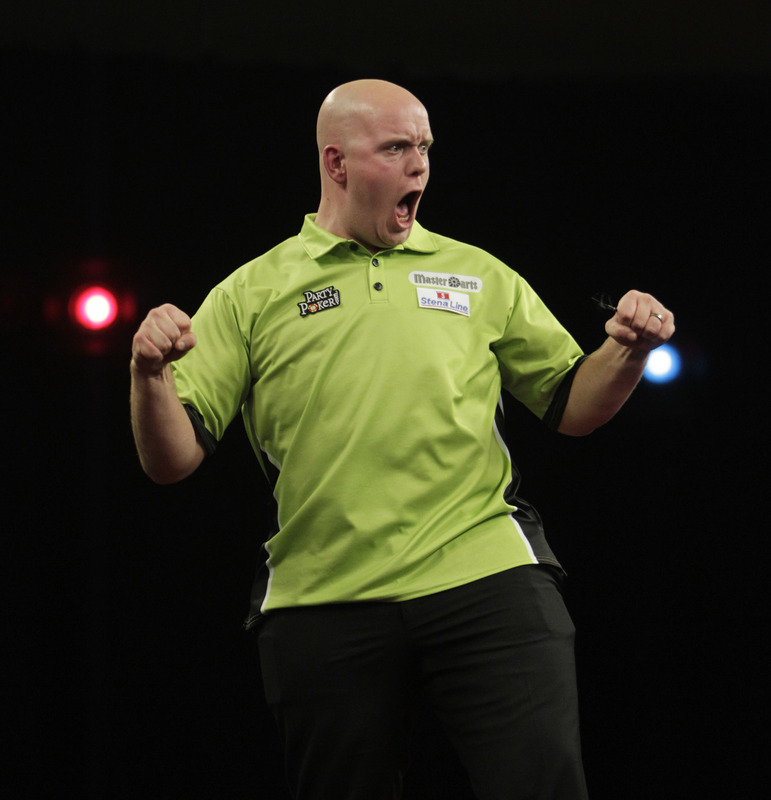 Michael van Gerwen booked his place in his first PDC major final after a brilliant performance saw him storm past Wez Newton at Dublin’s Citywest Hotel on Saturday. The Dutch darting sensation claimed a five sets to one victory against the European Championship runner-up, to go through to Sunday’s final, where he will compete for the £100,000 first prize. The players couldn’t be separated in the early exchanges with each of the first four sets going to deciding legs. Both players took one of the first two sets, before ‘Mighty Mike’ kicked on, winning the next four to progress. “It feels great,” said van Gerwen, whose Pro Tour title in Dublin on Saturday was his fourth of 2012. “To get through to the final in a tournament like this, in a place like this, with a crowd like this is very special. “It gives me a big confidence boost to play that well in a semi-final. I am very happy with my game. ‘Mighty Mike’ stamped his authority on the game from the off, starting with a 160 but a 180 followed by a brilliant 150 checkout gave Newton the first leg. 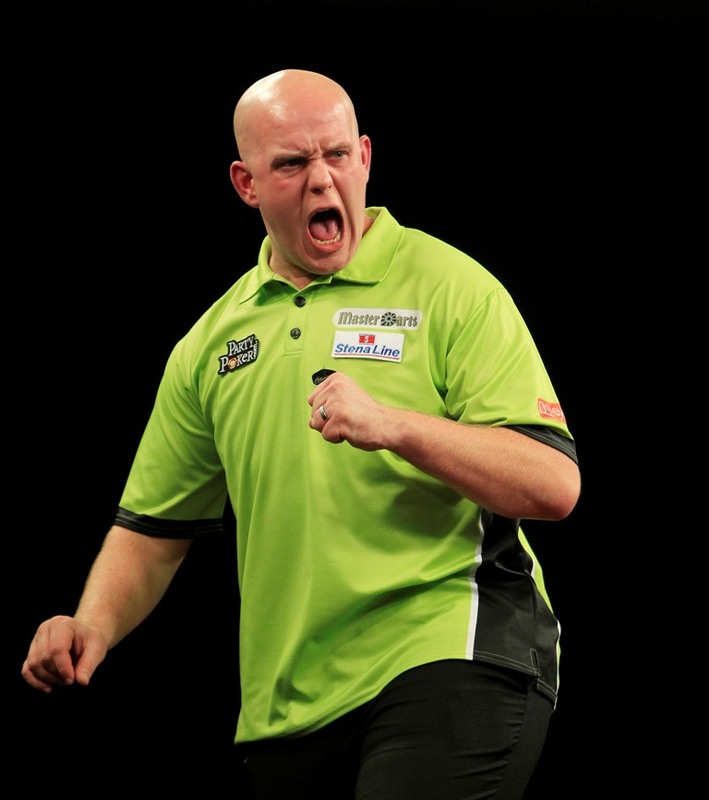 van Gerwen broke back before producing a fantastic finish of his own, taking out 136 to move a leg in front. Newton levelled but it was the Dutchman that took the first set by cleaning up 48.
van Gerwen posted double eight to take the first leg of the second set, breaking his opponent’s throw, but ‘The Warrior’ levelled. Newton took out 89 on the bull to hold before van Gerwen hit double four to set up a set decider, which the world number six won after ‘Mighty Mike’ took eleven darts to hit his starting double. 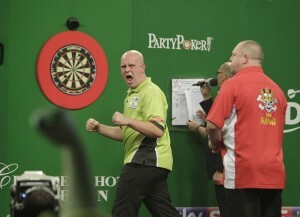 van Gerwen scored 174 to set up 16, which he took out to hold his throw in the set three opener. Newton also held but the Dutch ace hit double twelve to regain the advantage. The former World Master then hammered home his first 180 but Newton produced another stunning checkout, this time 152, to force a decider for the third consecutive set. van Gerwen moved a set in front once more with a neat 104 finish. He then hit a 177 in the first leg of the fourth set but was unable to break Newton’s throw. ‘Mighty Mike’ posted double ten to draw level before ‘The Warrior’ edged back in front. van Gerwen once again made sure the set would go to a deciding leg, which the 23-year-old won, hitting double eight to open up a two set advantage. The young Dutchman took the lead in the fifth set before doubling it with a 13 dart leg. He then moved into a four sets to one lead, hitting double two to move a set away from the final. van Gerwen grabbed a break of throw immediately in the sixth set before an 84 checkout sealed a fifth consecutive leg, leaving him needing just one more to progress. His second maximum couldn’t prevent Newton from stopping the rot. The Fleetwood flinger was only delaying the inevitable though, as ‘Mighty Mike’ took out 72 to reach his first televised final since winning the World Masters in 2006, aged 17.
van Gerwen will face either Brendan Dolan or Mervyn King in Sunday’s final.